Our new Starter Kits make it easy to try a wide range of infused products. 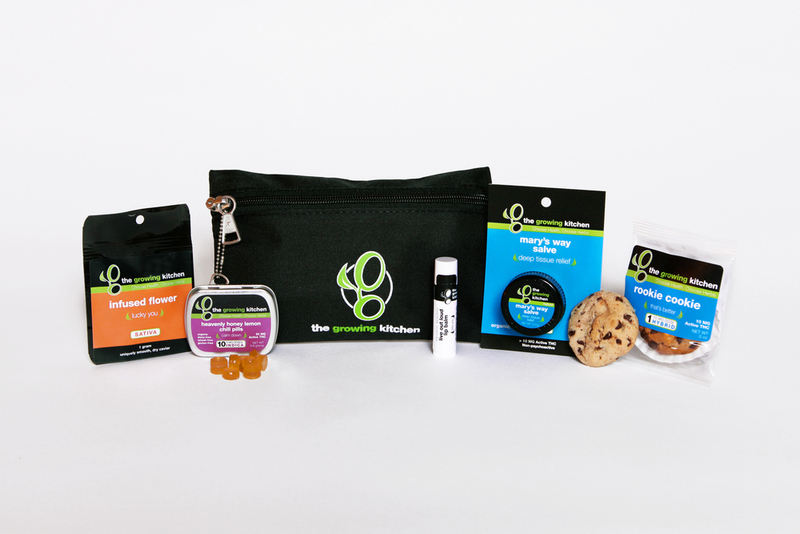 The Growing Kitchen's new Starter Kits make it easy to find new favorites in our cannabis-infused product line. These grab-and-go packs have a little something for every situation, from edibles to smokeables to topicals. A perfect treat for yourself, or a fantastic gift for someone who you want to shower with TGK love. Take a deep breath and chill out with our ever-popular all-natural chill pills. These delightful little gems will leave you with a sweet taste in your mouth and a new lease on life. Try our Heavenly Honey variety to enjoy the calming effects of our own in-house indica strains, combined with throat-soothing local Colorado honey. This crunchy chocolate-chip cookie is so delicious, you won't be able to resist eating the whole thing. And with 10 mg active THC, you will feel just fine if you do. The Rookie Cookie's pleasing effects are equally enjoyable for those new to cannabis edibles as for experienced users. It is also helpful for pain management and discomfort. A smooth salve that packs a powerful healing effect with a fresh, minty feel. This non-psychoactive topical deep tissue rub is great for sore muscles, inflamed joints, lower back pain or headaches. It combines the healing power of cannabis with a sumptuous blend of olive oil, shea butter, cocoa butter, and beeswax. This salve also makes a powerful decongestant when rubbed on your temples and chest or added to a bath. A luscious lip balm that treats dry, chapped lips with nourishing organic ingredients and our single-origin, whole-plant cannabis. This one goes on amazingly smooth with long-lasting effects. A combination of organic coconut oil, calendula, cocoa butter, shea butter, bees wax, lavender, eucalyptus, peppermint, tea tree, and Vitamin E moisturizes lips while helping to soothe discomfort and repair damage.